As our plane circled Detroit on the way to our City-to-City Visit, we looked down on a place eerily similar to Syracuse. The cities share a common past, titans during a period of industrial prosperity in the early 20th century. Both, like many of our Rust Belt cities, experienced a manufacturing boom that created a diverse and thriving middle class, but existed because of industries that enabled a hollowing of their urban cores towards the latter half of the century. Detroit, a city once of 1.8 million is now home to less than 700,000 residents, and Syracuse at its peak of 220,000 in 1950, was down to 145,000 in the 2010 census. What remained in both cities was pervasive poverty among our urban and minority communities, decaying physical infrastructure, and neighborhoods plagued with blight and vacancy. In Detroit alone, over 80,000 properties sit vacant, and in a recent study Syracuse was found to have the highest poverty rates among minority and Hispanic communities. But there’s hope, and if we can appropriately recognize the burgeoning opportunities that surround us then we can learn from our history in order to create a new social, sustainable, and civically conscious economy. 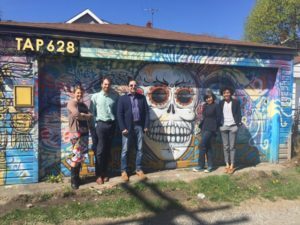 CenterState CEO’s Economic Inclusion team toured Detroit’s The Alley Project, which is transforming a neighborhood’s alleys and surrounding vacant lots into graffiti art galleries. The art is done by the community’s youth and neighbors. Our visit to the Motor City, hosted by Global Detroit, provided the opportunity to exchange ideas, challenges, and successes with a city tackling similar conditions in similar ways. In Detroit and Syracuse, people have recognized that one of our biggest opportunities to spur growth is to harness the talents and potential of our immigrant and refugee communities, and are innovating ways to better integrate these communities. What we learned from our partners in Detroit is that to effectively support immigrant and refugee communities in an effort to rebuild our economy we need to think holistically in our approach, and be collaborative in our work. 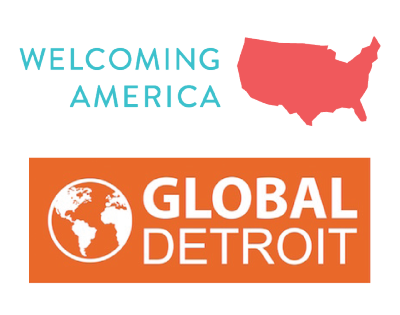 The Global Detroit team recognized early the necessity to create several programs in tandem, forming a comprehensive system of services to support immigrants and refugees from every angle – civically, socially, and economically. 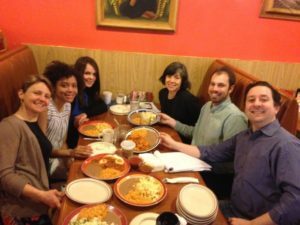 CenterState CEO and Global Detroit share their respective histories over a savory Mexican breakfast at Taqueria Lupitas. They also recognized the importance of connecting with partners throughout the process. In 2010, Global Detroit published a study identifying strategies to mobilize immigrant potential to build a global region with competitive advantages in economic revitalization. Informed by the conclusions of the study, Global Detroit identified key programs to launch over the next few years: Global Talent Retention Initiative (GTRI), which helps international students searching for jobs to build relationships with businesses; ProsperUS Detroit, an entrepreneurship training and development program focusing on low-income, minority and immigrant entrepreneurs; Welcome Mat Detroit, which fosters collaboration between service providers; and Cultural Ambassadors, a program that recruits Michigan residents to volunteer their expertise directly towards connecting immigrants, international students, and young professionals to their communities. Together, these programs address barriers immigrants face across the spectrum – upward mobility, access to social services, development of social capital, business development and job creation, etc. For this holistic approach to succeed, Global Detroit developed partnerships with local organizations that had the ability to house the programs and enabled them to grow and thrive. Global Detriot’s ongoing role then became, in addition to providing technical assistance, that of continued connector and advocate of programs, looking for new points of collaboration and community engagement to further improve programming. Learning about the success of their approach reaffirmed our team’s confidence in the collaborative model, as we embed workforce programming in an educational partner, and expand our service provider network to support the entrepreneurs in our Up Start program. Pascale Mevs of CenterState CEO presenting on our dual client Work Train model to Detroit practitioners. As part of the visit, Global Detroit convened workforce development providers in Detroit to hear from CenterState CEO’s workforce team about our Work Train model and how to build more effective programming that better aligns the needs of employers and of marginalized communities. We shared our experience involving employers from target industries and asking them to jointly detail their needs, which helped build candidate profiles that allow us to recruit from immigrant and other marginalized communities in order to build stronger partnerships, employees and companies. These positive hiring experiences for both the newly employed and the employers instill confidence in the model and a new trust in hiring from these communities. However, we do not have the capacity internally to run the programs in perpetuity, and we were able to explore the sustainability of Global Detroit’s model of embedding programs in partner networks. Global Detroit views Work Train as an innovative approach to workforce development and invited the group of Detroit providers to the table to learn about what is happening in Syracuse and explore how it may be applicable on the ground in Detroit – either through individual entities or more collaboration. The Detroit group found it extremely helpful to engage in a dialogue about the ins and outs of the program with its implementers and was inspired by the dual client approach. People in the room suggested Global Detroit, because of its leadership role as a connector in the region, continue to bring providers together and facilitate group learning across sectors from experts in other cities. Ultimately, the City-to-City visit was both enlightening and encouraging. 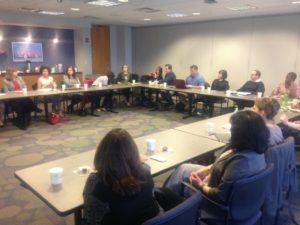 Detroit, Syracuse, and others in the WE Global Network realize that for our cities to experience sustainable growth we need to invest in our immigrant and refugee populations. We see it happening already, and in a way that is conscious of the mistakes of our past. Investment in immigrant and refugee communities means taking an all-angle approach, providing a full menu of programs and services to fully meet all the needs of building a committed community. And of course, collaboration and constant community and organizational engagement is the only viable way to succeed. As our plane circled Syracuse on our way home, we looked down on a city eerily similar to Detroit – not because of its storied history, but its vibrant future.